Attempting to restrict American imports of Canadian oil is a mistake that ignores both the reality of US dependence on imported oil, as well as the only major alternative sources of such oil—repressive governments that restrict civil, political, and economic freedoms. The study points out that Canada now provides more oil to America than all the Persian Gulf countries combined, even though America imports 5.5 million more barrels of oil daily than it did in 1973. Also, in 2009, the US relied on Persian Gulf countries for 14.4% of its oil imports, down from 24.5% of all US oil imports in 1979. In contrast, Canada supplied the United States with 21.2% of its oil imports in 2009, an increase from the 6.4% Canada supplied in 1979. 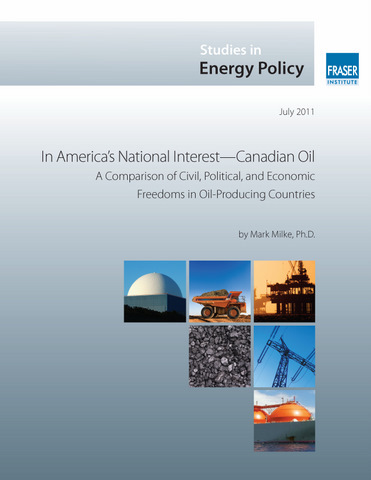 In addition to the reality of American oil demand and imports, this report measures how major oil-producing jurisdictions around the world, defined as those that produce more than 250,000 barrels of oil daily, perform on 17 comparisons of civil, political, and economic freedoms. The comparison includes eight measurements specific to women’s freedoms. A total of 38 countries, from five continents, are compared. For example, with the exception of Norway, Canada is the only major oil-exporting country that scores highly on all measurements of civil, political, and economic freedom, including the rights of women to full career, medical and travel choices; on media freedom, religious freedom, and property rights, as well as on other measurements such as judicial independence and relative freedom from corruption.